Hamas kidnapped Israeli soldier Gilad Shalit on June 25, 2006. The Hamas prisoner Gilad Shalit is doing well and gaining weight says Egypt’s Intelligence Chief. AN Israeli soldier held by Gaza militants for more than 15 months is in good condition, Egypt’s intelligence chief Omar Suleiman was quoted as telling an Israeli minister today. “Gilad Shalit is in good condition. He feels well and has even gained some weight because he does not do any exercise,” Mr Suleiman told Trade and Industry Minister Eli Yishai who held one-day talks in Cairo yesterday, one of his senior aides said. 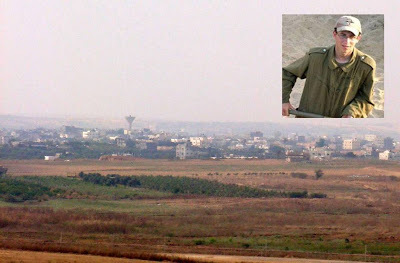 Cpl Shalit was abducted on June 25, 2006, in a cross-border raid by three Palestinian militant groups, including Hamas, which today rules the Gaza Strip. Question: Why would anyone meet hold a summit with the Palestinians until this soldier is released? RELATED: Iran Focus is reporting that the two captured Israeli soldiers by hezbollah were moved to Iran.